WooCommerce is undoubtedly the most popular ecommerce platform on Wordpress. Its very easy to use and tons of extensions & plugins are available. WooCommerce supports multiple payments systems. All the popular WooCommerce Payment Gateways can be integrated with your online store. With these gateways, Customers can buy products using their Credit/Debit Cards or PayPal account. 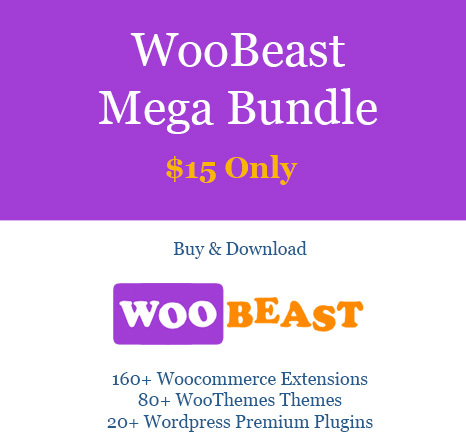 This is the complete list of available WooCommerce Extensions On Woobeast. Buy the whole pack to download them from one place! All the items products are genuine and untouched & regular updates will be there for you! Buy All in One Woocommerce Extension Megapack!